The History and Sociology of Technology and Science masters and doctoral degree programs train students in advanced scholarly research on the historical, social, and cultural dimensions of science and technology, past and present. Though highly interdisciplinary, the graduate program is housed in a single academic unit – Georgia Tech's School of History and Sociology (HSOC) – and thus enjoys close relationships among faculty and students. The HSOC community also benefits from being located in the liberal arts college of one of the country's premier engineering universities. Students and faculty may take advantage of the Tech library’s outstanding collection of technical literature and also have the opportunity to collaborate with colleagues in the Schools of Public Policy, International Affairs, Urban Planning, and Economics. Tech’s proximity to Emory University, Georgia State, and the Atlanta University Center is also an asset. Students in the Ph.D. program come from a variety of disciplinary backgrounds, including history, sociology, and science- and engineering-related fields, and recent Ph.D.s have gone on to both academic and professional careers. The faculty includes primarily historians and sociologists. Students emerge with strong training in both fields, and they also develop a unique perspective that transcends conventional categories. While many faculty members’ research programs center on science and technology, the program is also enriched by the presence of specialists in American, European, Asian, and Middle Eastern history, and in economic and historical sociology and sociology of race and gender. The History and Sociology of Technology and Science doctoral degree program trains exceptionally qualified students for a variety of professional careers. Led by a multi-disciplinary faculty, it encourages students to develop exceptional scholarship on important issues regarding the place of science and technology in modern human affairs. The program offers a genuinely integrative education, melding specialized study pertaining to science and technology with traditional disciplinary training. Students choose to concentrate in one of two disciplinary two: technology, science, and modern history, or sociology of science and technology. Students achieve the Ph.D. through successful completion of comprehensive examinations and a dissertation, as well as other requirements. Upon receiving the degree, they pursue diverse career pathways. Many graduates have made careers as college faculty in history, sociology, or an area of science and technology studies. Others exploit their unique cross-disciplinary knowledge and analytical abilities outside the academy in think tanks, public agencies, and private business. The History and Sociology of Technology and Science master's degree program appeals to a broad range of students and professionals. Those with technical backgrounds are exposed to broad socio-historical perspectives on science and technology, while those with backgrounds in the humanities and social sciences develop an aptitude for tackling scientific and technical questions. All students gain skills in social analysis and in oral and written communication, which serve to enhance employment opportunities in a variety of occupations. The master's in history and sociology can be a jumping-off point for further professional training in law, business, or public policy and is an asset to those seeking careers in museums, historical agencies, or other public history, and public service organizations. It is an excellent opportunity for those interested in high school or community college teaching and for current teachers seeking to upgrade their training and incorporate new materials into the classroom. In addition, it is often a first step for students pursuing the Ph.D.
Dr. Bill Winders is the Director of Graduate Studies for the M.S. and Ph.D. programs in the History and Sociology of Technology and Science. Graduate students have access to a superb cadre of faculty researchers. The School of History and Sociology features a range of fields of study. Graduate students in the M.S. and Ph.D. programs are engaged in a wide variety of cutting-edge research on science and technology. School of History and Sociology graduate students are immersed in a culture of scholarly inquiry and research. 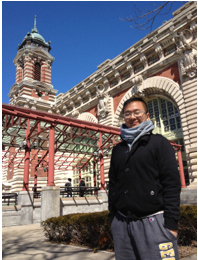 Xincheng received his B.A. and M.A. in China in archaeology and museum studies at Peking University and Fudan University. He also received an M.A. in anthropology at Columbia University in the city of New York. Xincheng is a second-year Ph.D. student in history. His research interests include urban history, modern East Asia, material culture, colonialism and racism, and the Chinese diasporas in the United States.